Travel on the new High Speed Train to Xi’an and then explore the ancient city wall on foot, by bike or electric buggy. Tonight, enjoy a performance at the Tang Dynasty Cultural Show over dinner. You’ll spend the next two nights at your historically located hotel. Continue your refreshments overlooking the Big Wild Goose Pagoda at sunset. Explore the maze of markets in the Muslim Quarter before flying to Guilin for an overnight stay at your elegant hotel. Enjoy picturesque vistas as you sail down the idyllic Li River to Yangshuo. Later, stroll around the Old Town before settling back at the luxurious hotel for a two night Special Stay. Return to Guilin and fly to cosmopolitan Shanghai. Travel on the high speed Maglev train, then enjoy a three night Special Stay. Stroll along the famous Bund and compare its striking heritage buildings to those in Yu Gardens. Across the Huangpu River, explore the Pudong area and discover modern China. Later, admire the view from Shanghai Tower, the tallest building in Pudong. Tonight, witness the renowned agility and skill of the Shanghai Acrobats. Soak in the view of the Bund and Pudong with farewell drinks from the rooftop bar. It’s the end of a journey you’ll look back on fondly for years. Marvel at the wonders of China on a 13 day tour from Beijing to Chengdu. 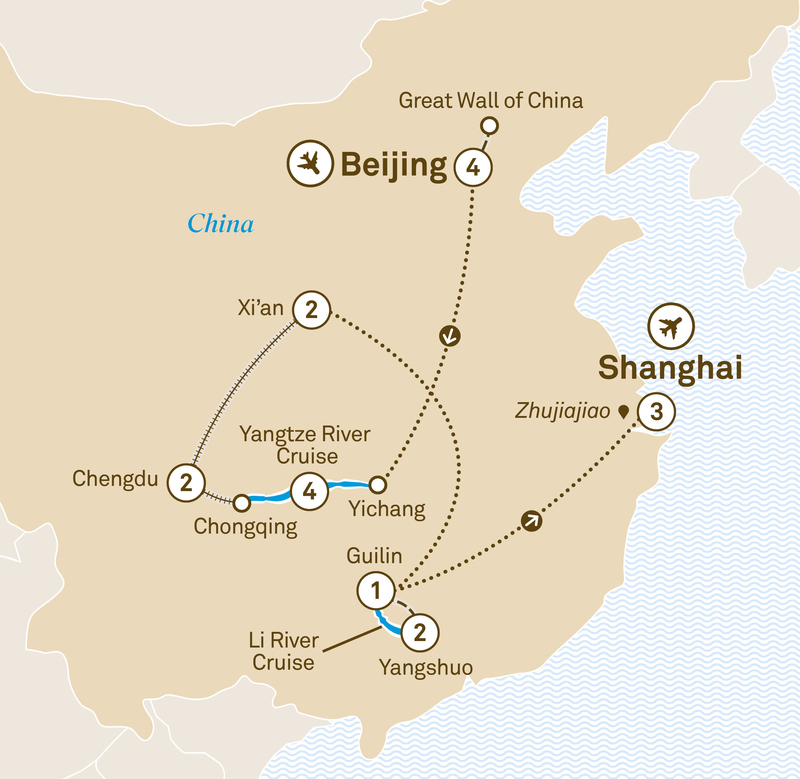 Visit the Giant Panda Breeding Centre, the Great Wall & cruise the Yangtze River.